On nearly every Jewish holiday, traditional songs are sung by young and old alike to celebrate and commemorate the importance of the day. These songs are deeply-seated in the Torah and tradition, but many have evolved to have important modern meanings and tunes. For Chanukah, there are two major songs that are sung right after the lighting of each night's candles: Maoz Tzur and Hanerot Halalu. Maoz Tzur (מעוז צור), which means "Stronghold of Rock" in Hebrew, is a popular Hanukkah song that is often sung after reciting the Hanukkah (Chanukah) blessings and lighting the Menorah. It is also a favorite song in synagogue religious schools, where children will sometimes put on a holiday performance for their parents and family in celebration of Hanukkah. Maoz Tzur is a liturgical poem called a piyyut (פיוט). The first letters of the first five stanzas form an acrostic, meaning they spell the poet's name, Mordecai (מרדכי), in Hebrew (mem, reish, dalet, kaf, yud). The poem is believed to have originated in 13th century Europe and is usually sung to the tune of an old German folk song. Some believe the tune should be credited to Judas Alias of Hanover (1744) and others cite correspondence about the tune in 15th century Bohemian-Silesian manuscripts. The six-stanza poem recounts the many times that God has delivered the Jewish people from their foes. The first stanza, which is the one that is usually sung on Hanukkah, thanks God for this protection. The next five stanzas talk about the Israelite Exodus from Egypt as well as the Israelite liberation from Babylonia, Persia, and Syria. 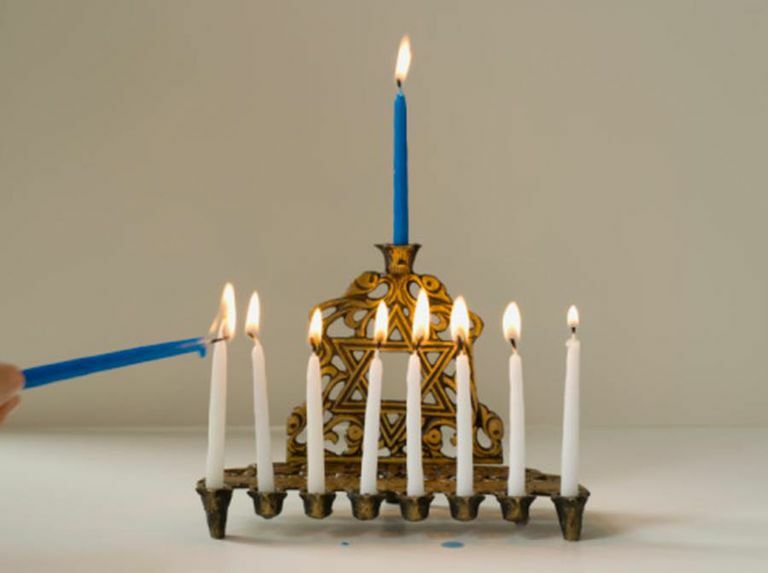 The fifth verse retells the story of Hanukkah, saying: "The Greeks gathered against me ... they broke down the walls of my towers, and defiled all the oils. But from the last remaining flask a miracle was wrought." Get the complete six stanzas. Hanerot Halalu (הנרות הללו), an ancient chant mentioned in the Talmud (Soferim 20:6), reminds Jews of the sacred nature of the Hanukkah (Chanukah) lights that commemorate and publicize the Hanukkah miracles. The song says that one's sole intent in kindling Hanukkah lights is to publicize the miracle, and thus it is forbidden to use the lights in any other way. After the reciting of the Hanukkah blessings and lighting the new light for that night, Hanerot Halalu is traditionally recited as additional lights are lit.